In Yemen, Agony Continues As Civilians 'Bear The Brunt' : Parallels An Amnesty International researcher provides a rare glimpse of life in Yemen, which the U.N. says is in the grip of a "massive humanitarian crisis." Will a new ceasefire help bring relief? 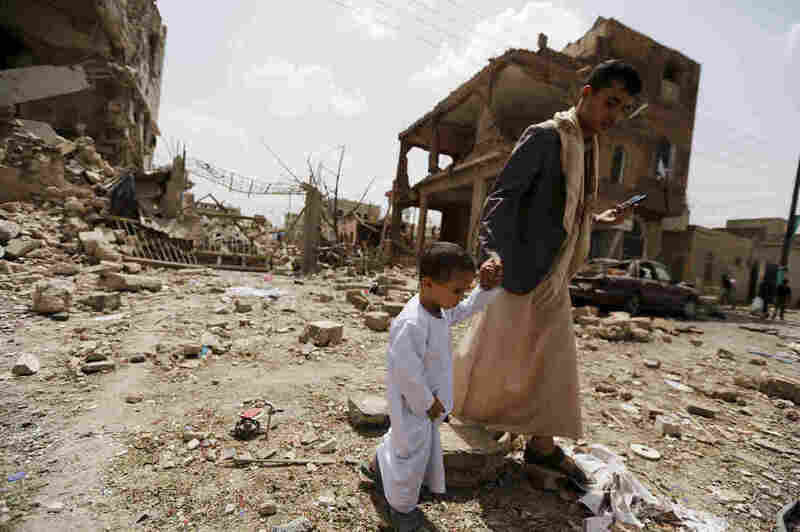 A man and a boy walk at a site hit by a Saudi-led air strike in Yemen's capital Sanaa on July 3. More than a million civilians have been displaced in recent fighting. It's not easy to get news these days from Yemen, where more than 3,000 people have been killed in fighting since March. As fighting rages between several different groups and Saudi airstrikes and a coastal blockade continue, the United Nations has warned of a "massive humanitarian crisis" in the country. Aid groups report that more than a million Yemenis have been forced to flee their homes, food and fuel prices are skyrocketing and there's a rising threat of diseases like dengue fever. UNICEF reported late last month that at least 279 children have died so far in the conflict, and warns that millions are at risk of malnutrition, diarrhea and other illnesses. Rasha Mohamed, a London-based researcher with Amnesty International, tells NPR's Kelly McEvers on All Things Considered about recent deaths she documented of children killed in an airstrike in Sanaa, Yemen's capital. She's been observing increasingly dire conditions faced by residents there and in the northern city of Saada. Mohamed has shared some of her observations and photos on Twitter. Additional photos are on Amnesty International's website. "It's getting worse and worse," she tells McEvers. A new ceasefire is to go into effect Friday. They tell us that we don't have enough to eat, things don't get to them, there is no petrol, they can't get out of their areas at times, and if there [are] these things, they can't afford them. This is the biggest issue right now in Yemen. There might be things available in the markets, but people just can't afford them, so it's getting worse and worse. [Food and fuel prices] quadrupled. Most of the time, a bag of flour has quadrupled, if not more. Same with fuel – a cylinder of gas, cooking gas, would have been around 1,200 Yemeni rials [$5.58], now it goes up to about 5,000 Yemeni rials [$23.24], which is, you know, very difficult for a family that's trying to cook for 20 members. So that's one of the main issues here. Sanaa has not been as hard-hit as other areas, I would say. In Sanaa, [attacks] tend to focus on military infrastructure, airports, military locations and camps. Every now and then, they focus on airstrikes on the leadership ... And that's when civilians get caught in the middle and they bear the brunt. So they might either miss their targets, or they might hit the actual house and shrapnel might kill civilians in the area. That's what we've observed so far in Sanaa. On the second of July, bombardment was very heavy in Sanaa before we headed to Saada, and we headed straight away after the airstrikes ... And what had happened they had apparently intended to target a house next door to the house that was struck ...The airstrike missed the house and hit the house next door, where a caretaker and his family – nine children and his wife – live. They take care of the house. The person who owns the house doesn't live there anymore due to the situation. So the caretaker, actually ... had already lost his son, Sammie, who was the youngest, who was around five. And there were two children still under rubble when we arrived at 2 p.m. They couldn't dig them out until 1 a.m. the next day. They didn't [survive], unfortunately. He lost three kids, and it just happened that the wife and the kids actually live in the countryside. They had just arrived to visit the father the day before. So it was quite tragic. I think a pause to the fighting would be very much welcomed. However, I think what needs to happen is an end to this crisis. I mean ... prior to this, already 60 percent of the population [was] aid-dependent. Now it's 80 percent of the country aid-dependent. Plus dengue fever is spreading. People are internally displaced. Now it's up to 1 million people internally displaced. That doesn't include old people who were internally displaced from old conflicts in the country. I think this humanitarian pause that's being suggested is just a really short-term solution. It's not really going to bring the results that people need. In fact, the last humanitarian pause was broken by armed groups in Aden and in Taiz. The fighting continued. Airstrikes might have, you know, stopped, but the armed groups, they're all fighting on six different groups in the country — and they don't stop during the humanitarian pause. So I don't think it's going to help in the long or short run.